Sensa was created by Dr. Allen Hirsh who is a certified Neurologist and Psychiatrist. He has devoted much of his professional career to the study of the human sensory system. As he began to research the sense of smell, he discovered that those who had lost their sense of smell usually gained 10 to 30 pounds. Hirsh began to further study the smell, hunger, and appetite connection until he was able to develop so called “tastants” that when sprinkled on food, seemed to help the users of these “tastants” eat less and feel satisfied quicker. In his study 1,436 women and men sprinkled these “tastants” on everything they at for 6 months. At the end of the study the participants on average lost 30.5 pounds. The control group of 100 participants who did not use the “tastants” on average lost only 2 pounds. 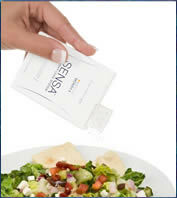 Sensa is not a diet, but flavorless “tastants” that users sprinkle on all the food they eat during the day. There are “savory tastants” for salty food and “sweet tastants” for sweet food. There are no forbidden foods with the Sensa program as the “tastants” are supposed to make you feel satisfied quicker so you eat less. As part of the program you receive two shakers of “tastants” per month with one being a travel size for restaurant eating. Sensa retails for $374.00 for a six month supply. There has been a lot of research devoted to the taste/smell connection and smell’s effect on appetite. However, all of Dr. Hirsch’s research was funded by his own “The Smell and Taste Treatment and Research Foundation”. To our knowledge this study has not been peer reviewed or replicated by independent research. Sensa doesn’t promote a healthy diet or exercise as part of overall good health which could lead to other health issues. amazing discovery …. our youth really need this types of things for their proper health care..